A butterfly garden can become an oasis of beauty and serenity in your yard. Creating a garden that will attract butterflies will make your yard beautiful during the growing season and help you enjoy nature. The variety of butterflies visiting your butterfly garden upon completion will make the project worthwhile as nature makes itself at home in your backyard. Choose a location. A butterfly garden should be created in a sunny location where plants can receive plenty of sunlight and butterflies will be able to warm themselves in the sunshine. Choose a spot that has well-drained soil. A butterfly garden can be any size--from a few small pots, window box or small area to a large cone in you yard. Provide nectar plants. Butterfly gardens need to provide food for visiting butterflies. Nectar plants will attract a variety of butterflies that will visit to feed. Perennials like sedum, yarrow, salvia, day lilies, bee balm, astilbe, coneflower and others will draw butterflies to your garden. Offering a mixture of perennials, annuals, wildflowers and shrubs will bring out the butterflies. Other nectar sources that are excellent choices for attracting butterflies are milkweed, butterfly bush, lilac, ironweed, Queen Anne's lace and geranium. Provide host plants. 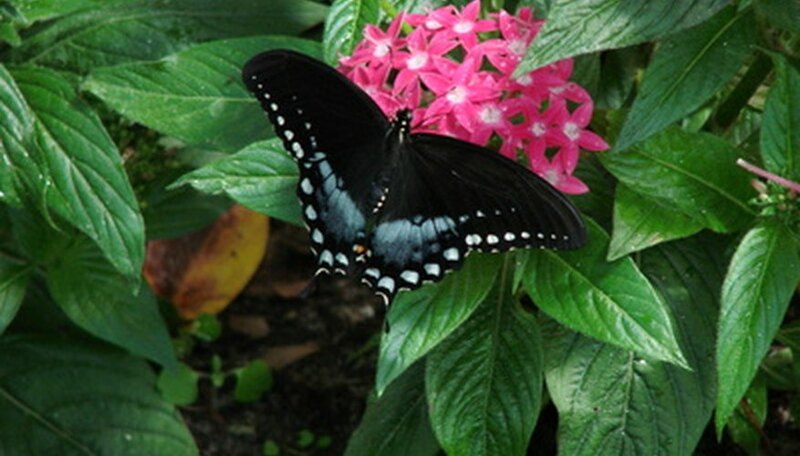 A butterfly garden needs to provide host plants upon which butterflies will lay eggs. The young caterpillars will feed on the host plants until they pupate and become adult butterflies. Check with your local department of natural resources to determine the species of butterflies in your area to decide which host plants to plant in your butterfly garden. Provide a water source. Butterflies need a water puddle to receive moisture and minerals. A shallow puddle filled with sand, rocks and enough water to cover the sand or a bird bath full of water and rocks will be adequate for visiting butterflies. Create a seating area. Whether you want to sit in the midst of you butterfly garden or you prefer to watch from the sidelines, a seating area should be created to allow you to sit comfortably to watch your butterfly visitors. Choose a spot that will give you a good view and will allow some shade for your comfort. You will have the opportunity to observe butterfly mating habits as well as the life cycle as the caterpillars grow in size and eventually become adult butterflies. Visit your local library or bookstore to find books and identification guides for butterflies in your area. Take photos of visiting butterflies and caterpillars to reference later as you identify them. Do not use herbicides or pesticides in your butterfly garden.